A grass swale is a graded and engineered feature appearing as a linear, shallow open channel with trapezoidal or parabolic shape. The swale is vegetated with flood tolerant, erosion resistant plant species. The design of grass swale promotes the conveyance of stormwater at a slower, controlled rate and acts as filter medium removing pollutants and allowing stormwater infiltration. When properly designed, to accommodate a predetermined storm event volume, a grass swale results in significant improvement over a traditional drainage method as both slowing and cleaning of stormwater is achieved. In swales stormwater can be slowed and treated to desired levels by the placement of check dams. Correctly designed grass swales / Biocod systems can offer significant economical and environmental advantages. Are favoured for use of treating stormwater runoff form highways and domestic roads becasue of their leniear structure. 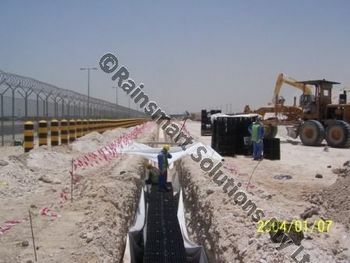 Provides ground water recharge and infiltration.